Diodepi Smart™ | 808nm diode laser system uses special semiconductor laser with long Pulse-Width 808nm, can penetrate to hair follicle effectively. When laser outputs, system with special cooling technology, cool the skin and protect skin from being hurt and reach a very safe and comfortable treatment. Intelligent 3D Contact cooling system. Real Sapphire Crystal built in head enable efficient cooling delivery. Self-monitoring system: Water flow, water temperature and water level. SFS technology enable super fast and more efficient treatment as the repetition rate reach up to 10Hz. It allows operators quickly scanning the treatment area which greatly reduce treatment time and achieve better result. The high average power, low fluence, high repetition rate SHR mode pulses slowly increase the temperature of the hair follicle containing the cells responsible for hair regrowth. By constantly moving the handpiece during treatment, the energy is delivered safely and more uniformly, eliminating skipped spots and ensuring patient comfort. SFS technology combines concurrent cooling with a gradual thermal rise to the target’s critical temperature, while minimizing the risk of injury and with much less pain for the patient. It represents a breakthrough in patient comfort, speed of procedures and repeatable clinical results. This is in contrast to the high peak power delivered by traditional IPL technology that require high cooling before, during and after each flash. The SFS technology enables continuous administration in a larger treatment area for increased comfort and fewer missed spots. Here is a short video instruction of our diode lazer machine treament. The Diodepi Smart Adopt separated cooling system, its genius design makes diodepi Smart more flexible, it’s no longer a problem to carry it from one place to another place. Diodepi Smart takes the advantage of separated cooling system, which makes enough space to improve the high performance, even it’s a desktop model with limited size, we can still guarantee the high quality performace. Diodepi Smart adopts Jenoptik Laser module which is imported from Germany. 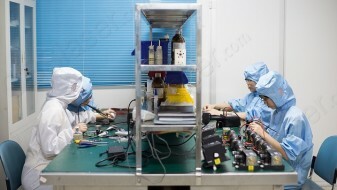 Most of suppliers in China use Xi‘an focuslight company laser module. The quality is good, but not good enough, so we imported from Germany. Of course, some companies even use more worse. All the laser modules are packaged under dust-free workshop. The power of laser module are accurate measured by precise instrument. The power of Diodepi Smart are accurate measured by precise instrument, the laser module power is 400W in total. Diode laser hair removal treatment can be used for all skin type and very effective for all skin type except skin type VI. Diodepi Laser support more than eight languages, Chinese, English, German, Italian, Portuguese, Russian, Spanish and Polish etc. to meet all of the clients’ requirement all over the world. The Default languare is English, it only show one kind of language on machine. Diodepi Smart adopts the laser source with German cooling technology, The cooling system offer precise and constant temperature (4℃), which can ensure painless of hair removal. More than 5,000,000 shots ensures longer lifetime than other hair removal machines. Which Skin Type is the Diode laser suitable for? Diode laser treatment can be used for all skin type and very effective for all skin type except skin type VI. Is Diode laser hair removal permanent? How does the diode laser remove hair? I’m pregnant/planning on becoming pregnant. Can I still be treated? That depends. Pregnancy restricts the use of topical anesthetics and may present some other challenges. While there is no evidence to suggest that pregnant women cannot be treated safely, it is our policy not to treat without written permission of the patient’s physician. When you come for your consultation, we can discuss the particulars of what you would like to have done and review your options.